Mr. Trevor inherits a piece of land in the country called Myst Court, and plans to move there with his three children: Emmie, Bruce, and Vibert. 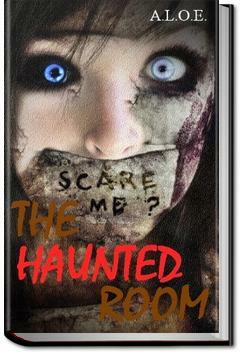 But rumor says that a room in the house that is haunted. Bruce and Mr. Trevor tell Emmie there are no ghosts, but Emmie can't help but be afraid--or can she? For fans of Stephen King, Clive Barker and Dean Koontz. “Where is Bruce? I have not wished him good-bye,” said the captain, pausing when he was about to hand his niece into the carriage. I love mystery stories, and while this wasn't a typical mystery, I loved the message at the heart of this book, as well as the elements of surprise thrown in. A great reminder to continually guard and examine what is in our own "haunted rooms"- the depths of our hearts. Really enjoyed the Lamplighter production of this story! I like Lamplighter, but sometimes it can be too depressing, so much so that the depression overwhelms the story. That, happily, did not occur here. Fear can keep us from being what God made us to be! Listened to the Lamplighter Theatre production of this book, and it was excellent! As usual, the story always seem to mirror what is going on in our life relating to issues we need to work on. We didn't read the book, but listened to the audio drama. We always enjoy listening to the stories in the car.